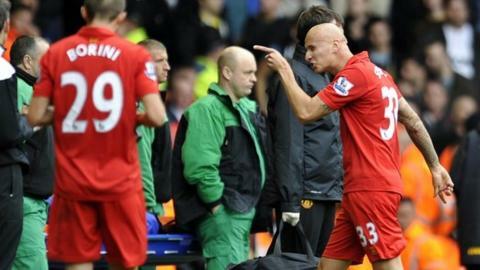 Liverpool midfielder Jonjo Shelvey has apologised for his red card in his side's 2-1 defeat by Manchester United. Shelvey, 20, was sent off for a challenge on Jonny Evans in the first half of a feisty encounter at Anfield. He argued with United players before being dismissed and rowed with Sir Alex Ferguson on the way off the field. "I apologise to the fans for getting sent off but no way was I pulling out of that tackle in a game of that importance," Shelvey tweeted. "I'm sorry. I have also apologised to Sir Alex Ferguson. Where I come from people don't grass people up to get someone sent off." Speaking immediately after the match, Ferguson was critical of Shelvey's reaction. He told BBC Sport: "I was disappointed. It was silly and when he looks at himself he may apologise and he may not, it doesn't matter. "But it was a reckless challenge that could have caused damage." Liverpool manager Brendan Rodgers felt Evans should also have been dismissed for his part in the incident, in which both players lunged for a loose ball.